Here we have various videos that we have appeared in, that we made, or that we just like a lot. Enjoy. Posted 18 Sept. 2011: Once upon a time at the Comic Con Masquerade (1999), we tried to put a twist on all of the Sailor Moon entries. We came up with our own Klingon Sailor Qu'nos. 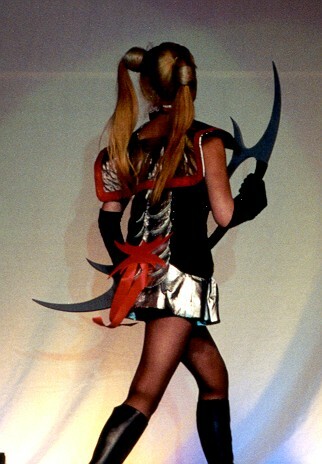 Just another Sailor Scout, but with attitude. Below are a couple photos and the audio that we submitted. What should have happened was that during the introduction, Sailor Qu'nos was to walk out onto the stage with only back lighting, then get hit with the spot when "Sailor Qu'nos" is introduced. She speaks her lines, walks off during the music, then has a brief fight off stage. She returns to the stage momentarily, now with a severed head on her bat'lith. She calls out "Qapla'" and exits. But the technical crew blew it, big time. The stage was fully lit for the entire performance and they cut off the introduction and the exit. Sigh. Posted 7 April 2011: Jeff Bohnhff has struck yet again! This time from their "Aliens Ate My Homework!" CD. Posted 12 March 2011: At Consonance, Paul Kwinn had a song about Deborah Marion Kazumi Yow-Hoo-You Betcha Baby Ridpath Ohi, The First. Posted 29 Sept. 2010: Jeff Bohnhoff has struck once more. Where does he find the time? Posted 12 Sept. 2010: Jeff Bohnhoff has struck again. This time, Kristine, his daughter, sings lead for another Star Wars parody. Posted 4 Sept. 2010: Jeff and Maya Bohnhoff did a Star Wars parody of "Bohemian Rhapsody", "Midichlorian Rhapsody". Jeff has created an excellent video to go with it. Posted 15 Aug. 2010: San Diego ComicCon, 1998, The Lady Geeks were on stage for the Masquerade. Home life can be difficult for the young Super Hero. Posted 15 Aug. 2010: Jeff and Maya Bohnhoff have done a beautiful parody of Sting's "Every Breath You Take," which is, after all, a stalker's song. 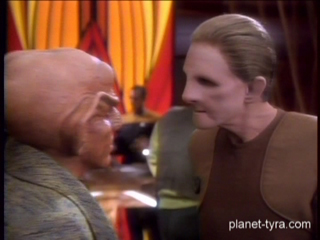 Well, Jeff and Maya's version is also about stalking, but this is a good thing when you're on "Deep Space 9," and it is sung from Odo's point of view. From the "RETRO ROCKet SCIENCE" CD and "Star Trek: Deep Space 9." Lyrics Jeff and Maya Bohnhoff, melody Sting. Posted 15 Aug. 2010: The Harmony Heifers, with Maya Bohnhoff in lead, Chris Dickenson and Elizabeth Burnham backup, and Jeff Bohnhoff playing accompaniment, pay tribute to the problems of having Holo Decks in the Star Trek Universe. Your Captain may have to be the Bride of Chaotica. From the "Harmony Heifers" CD and "Star Trek: Voyager." Lyrics and melody Deborah Baudoin.